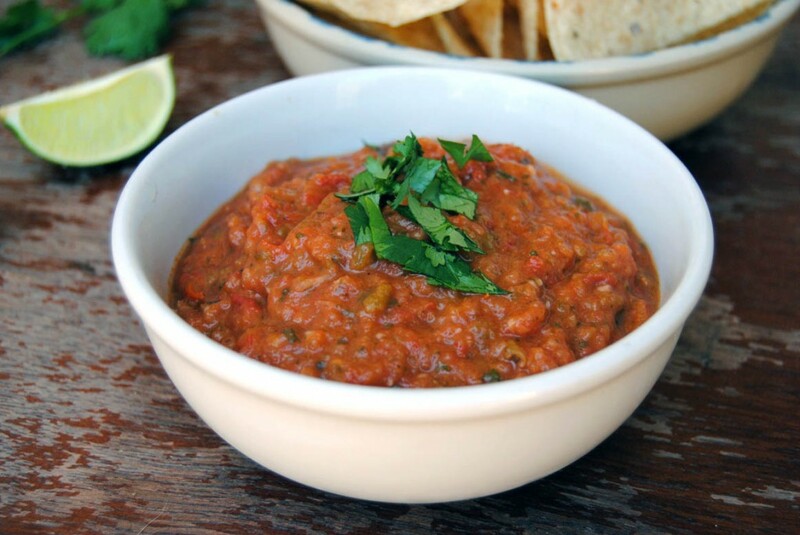 Roasted tomatoes and peppers give a rich and smoky flavor to this smooth and mild restaurant-style salsa. Hello, my name is Kalen and I am a salsaholic. When it comes to salsa, I have a complete lack of self-control. Sometimes I think I should just stop ordering entrees at Mexican food restaurants, because by the time my food arrives I’m already completely stuffed. One basket of chips is just never, ever enough. I once seriously considered storming angrily out of a restaurant that wanted to charge me for a second serving of salsa, but didn’t, because I really wanted a second serving of salsa. A lot of people are picky when it comes to salsa and have very specific preferences, but I don’t discriminate. It can be mild or extra spicy, chunky or smooth, red or green. As long as the ingredients taste fresh and the salsa is flavorful, I’ll be happy and will probably eat an unreasonable amount and then not be able to finish my dinner. On the bright side, though… leftovers! 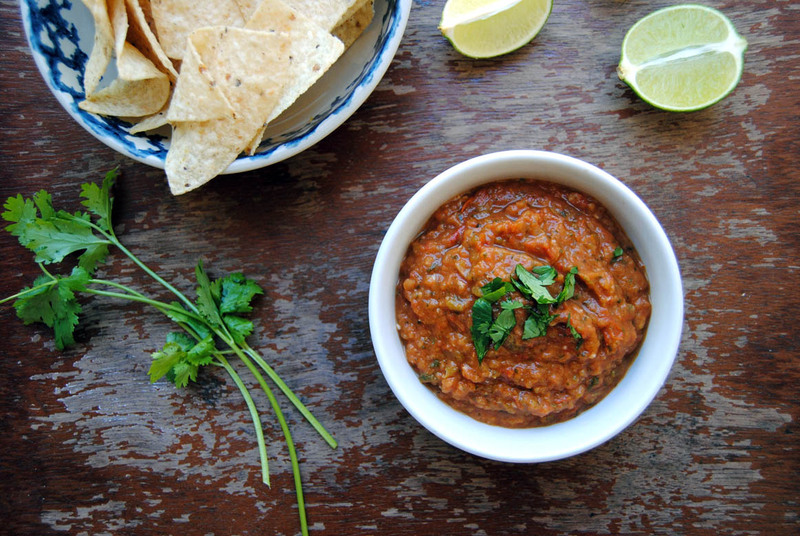 This is a very mild salsa recipe. It’s extremely flavorful, and you can taste both the poblanos and the jalapeños, but it’s not at all spicy. That’s exactly what I wanted this time, but if you want a spicier salsa, don’t remove the seeds and veins of the peppers. 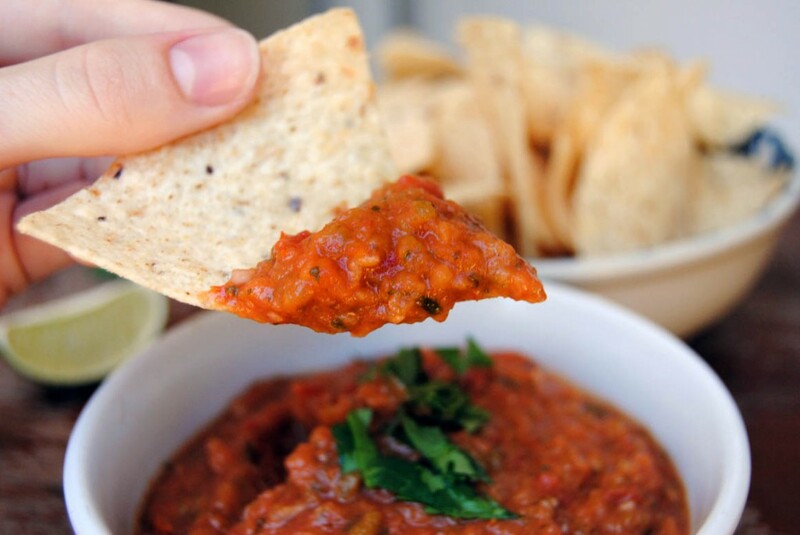 You can also play around with the consistency of this salsa. I was in the mood for a smooth salsa, but you can leave it chunkier if that’s what you prefer. You could even coarsely chop the cooked peppers and tomatoes before putting them in the food processor, then just pulse a few times for a really chunky blend. Combine the tomatoes, peppers and garlic in a mixing bowl and toss with olive oil and a bit of salt and pepper. Spread the oiled vegetables evenly on a baking sheet. Roast for about 25 minutes or until everything is soft and beginning to blacken. Set aside to cool. In a food processor, combine onion, cilantro, and the cooled vegetables (along with all the juice from the pan). Add about half of the lime juice. Pulse until the salsa reaches your desired consistency. If necessary, season with salt and pepper and the additional lime juice and pulse again to mix. Hey Instagram followers! 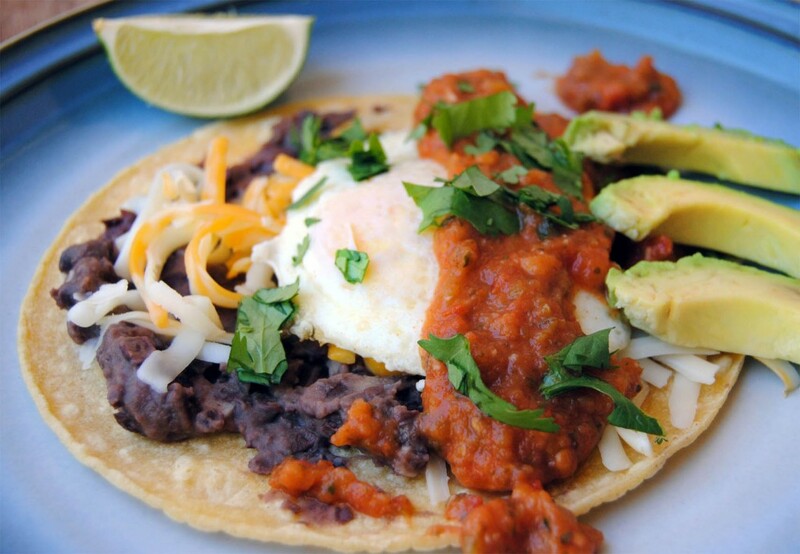 Because you are all just so awesome, I have a special bonus recipe for huevos rancheros with roasted tomato salsa. Yum. I usually eat this as a late breakfast on a lazy morning, but it’s also a quick and easy weeknight dinner. If you don’t follow me on Instagram yet, but want to, just click the Instagram link at the top right of the page, or search for chubbysoul on Instagram. I’m just getting started, so I can use all the support I can get, and in return I’ll post bonus recipes for you every once in a while. Enjoy! Oh. My. Word. This is the best salsa I have ever had! I’m probably going to dream about it! This is the best salsa I have ever eat. is easy to make and very tasty. Thanks so much, Vanessa! It’s my favorite too.